“For millions of Americans, this is a time of doubt, despair, and the pain of loss. “I have no ‘remedy’ for this widespread suffering—and if I said I did, you’d know you were hearing from yet another con man. “But this much I know to be true: doubt is the other side of faith, despair is the other side of hope, and the pain of loss is the other side of love. 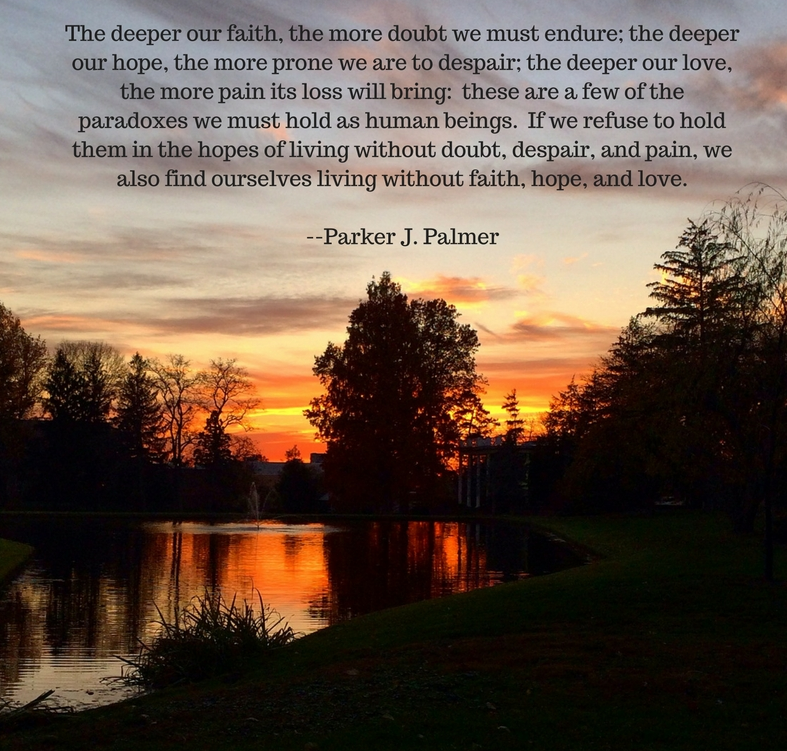 “The words (inscribed on the photo above) come as close as I can to saying why we must learn to hold our doubt, despair, and pain—until we can reclaim our belief, our hope, our love. “We can hasten that day by joining in the never-ending struggle for love, truth, and justice in whatever ways we’re able. My solo drive to PA a few days after the election allowed for many prayerful tears, brought on by election trauma and intensified by news I did not want to hear about the son of a soul friend. While visiting my parents provided a good distraction from election fallout, I kept one eye on social media where I was horrified to learn from a peace and justice compatriot that she had spotted white supremacist leaflets on her walk to work in South Bend. Eventually, becoming nearly seasick in response to “the waves that rise and fall in the sea of being,” I shifted into resource-gathering mode to work at combatting the fear and despair settling upon me for the many who have been singled out in our country as different from the majority. I borrowed Cindy Crosby’s term “spark in the dark” from last week’s edition of Tuesdays in the Tallgrass and began watching carefully for every ember, every spark of light that might come my way in this perceived darkness. And sure enough, the sparks began flaming toward me: the evening my dad surprisingly engaged in conversation when an unexpected visitor stopped by, this delightful PBS documentary on Three Rivers Spirituality (if this video does not post, read the transcript option) by correspondent Judy Valente posted in Religion & Ethics Newsweekly, these amazing renditions of the late Leonard Cohen’s Hallelujah. YouTube is full of endless examples of upbeat music. I added this Canadian Tenors version of the Cohen favorite as another of my best-loved for listening in the midst of despair. Or this one where Oprah surprises the Canadian Tenors with an appearance by Celine Dion. Or the 12 Tenors singing You Raise Me Up. Here’s another good story that I shared a year ago; a friend resurrected it again this week…it seems consoling when the world suddenly appears to be less safe for the other than it used to be. There were these comforting words from poet David Whyte: “The antidote to despair is not to be found in the brave attempt to cheer ourselves up with happy abstracts, but in paying a profound and courageous attention to the body and the breath, independent of our imprisoning thoughts and stories, even strangely, in paying attention to despair itself, and the way we hold it, and which we realize, was never ours to own and to hold in the first place. To see and experience despair fully in our body is to begin to see it as a necessary, seasonal visitation, and the first step in letting it have its own life, neither holding it nor moving it on before its time.” For more on Whyte’s approach to despair, see this link. And finally, I discovered Sojourners’ helpful list of 10 commitments we can make during a time when minorities feel threatened, starting with going deeper in faith, lifting up truth, rejecting white nationalism, loving our neighbors, and welcoming the stranger. A Zero Balancing/Soul Lightening Acupressure session with my body/energy-worker friend helped release built-up pain and trauma from the past as well as some of the stress of the present, while Sunday's baby shower at Kern Road eased me back toward hopeful mode as I experienced the gathered community welcome this new little one into our midst in spite of the fact that our country no longer seems as much a sanctuary as I have imagined. May we take small steps together to make our homes, our places of worship, our communities sanctuaries for the marginalized and oppressed. 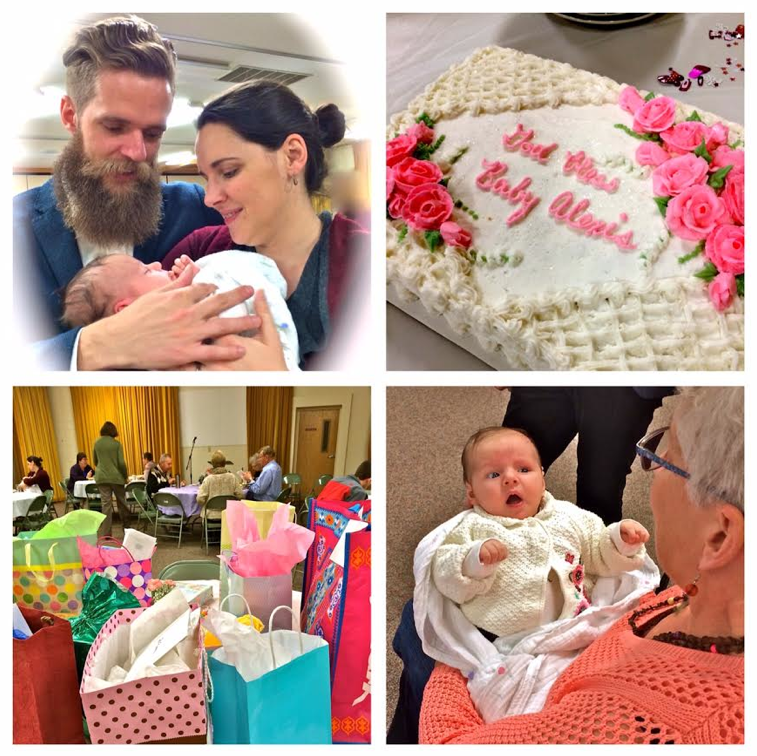 In spite of the “waves that rise and fall in the sea of being,” we celebrated the arrival of baby Alexia!